When considering a visit to Australia, most people think of beaches, the Great Barrier Reef, and bustling cities with colorful food scenes. The real heart of The Land Down Under, however, is hiding far in the outback. Here, the ground is red, the sun is hot, the night shines with millions of stars, and life is lived in harmony with the land. 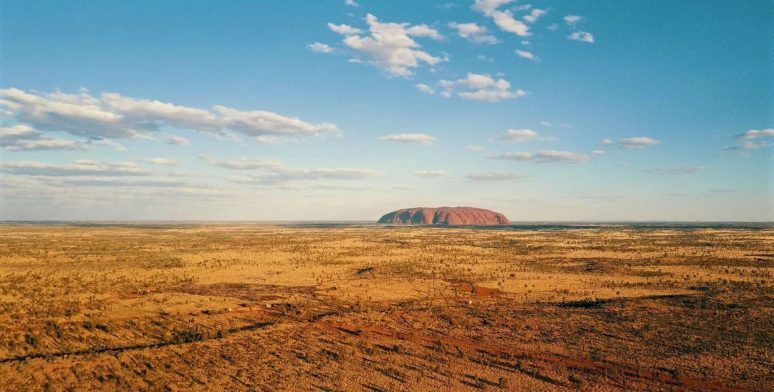 Head to the Northern Territory to find Uluru (Ayers Rock), the spiritual heart of Australia. 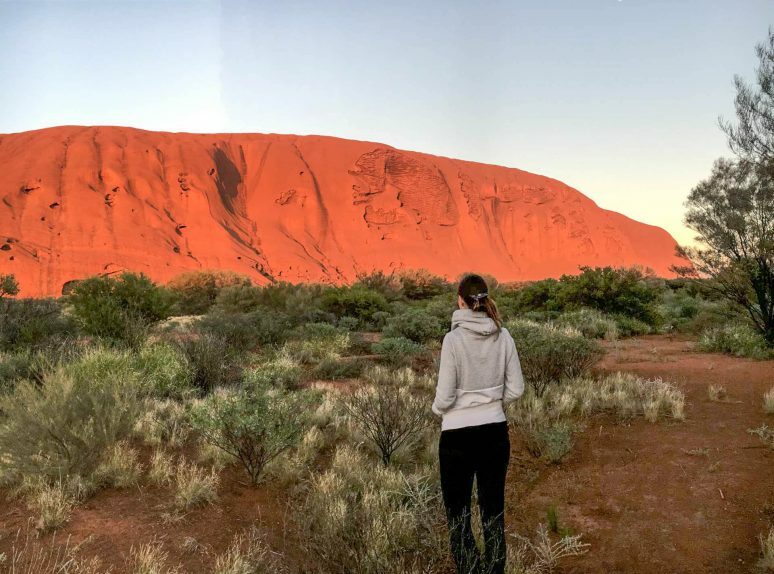 Beautiful sunrises and sunsets, ancient landscapes, and fascinating culture are just a few of the reasons you should visit Uluru. Often overlooked by domestic and international travelers, the ‘Australian Red Center’ offers its visitors a more secluded and spiritual experience. Uluru, also called Ayers Rock, is a massive red sandstone monolith in the Northern Territory. Visiting Uluru in the Australian outback was one of my favorite travel experiences to date. 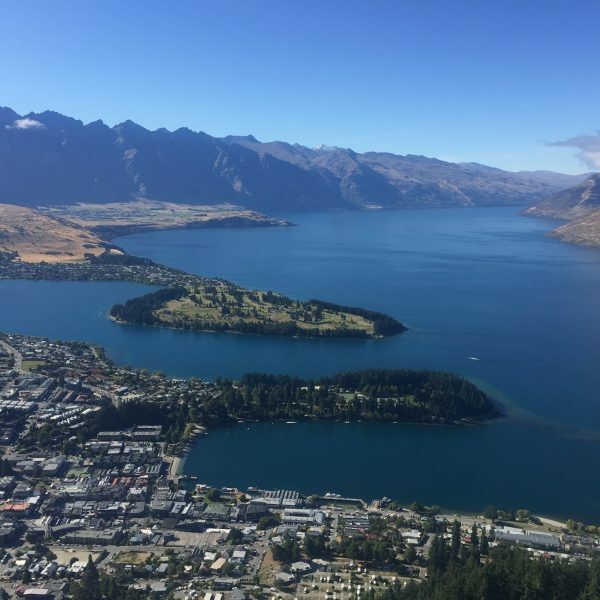 Here are the top reasons why you should plan your visit. Although most prefer to sleep in while on vacation, don’t miss sunrise at Uluru. 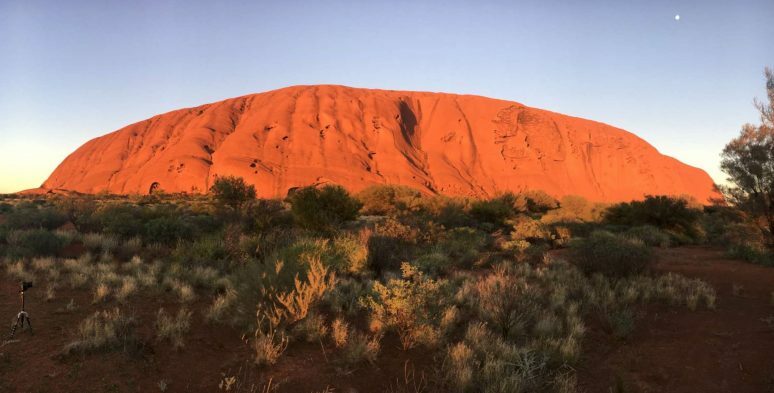 Wake up early to watch Uluru and the surrounding landscape change colors until it glows in a vibrant red. We did the sunrise tour on our first day and were so mesmerized that we woke up for sunrise every morning thereafter! Photos often show people waiting for the sunrise at Uluru, squeezed onto a small platform with cameras in hand. When booking your sunrise tour, choose wisely to avoid the crowds. We picked an Uluru tour promising a maximum of 15 people in the group. Our tour guide also took us to a secluded area where there were no other tours, only few locals jogging. It was really a magical experience and it gave us more time to actually enjoy the sunset, rather than fighting the crowds to get a good photo. With whatever tour you book, confirm the maximum group size and ask whether you will be visiting any less touristic places. Lighting up at sunset and glowing throughout the night, Field of Light is a beautiful celebration of nature and design This breathtaking art installation by British artist Bruce Munro covers 49,000 sq. meters of land. Delicate light stems scatter the earth, each handcrafted, recyclable, and entirely solar powered. In the complete darkness with stars overhead, find thousands of sparkly little spheres at your feet, changing colors and making funny sounds as you walk by. You’ll feel like you’re in different world. At the time this article was written, this amazing exhibition was set to close on December 31, 2020. However, the date keeps being extended due to massive demand. Although sunrise at Uluru is not to be missed, sunset is no less breathtaking. The best way to enjoy the Uluru sunset is with some unusual local food, refreshing drinks, and good company. I recommend organizing a sunset dinner through a company to ensure you get the full experience. 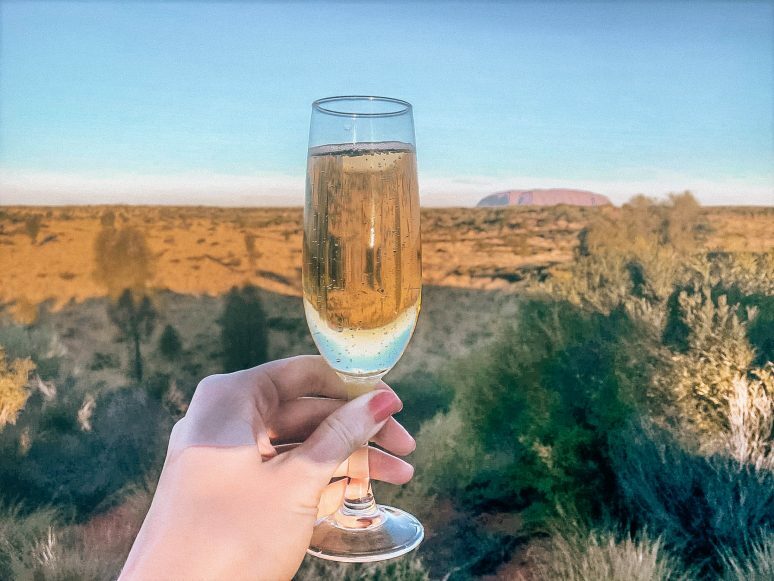 Just imagine standing on a sand dune while listening to the vibrating sounds of the didgeridoo with a glass of champagne in hand, and Uluru and the reddening sky as a backdrop to this perfect moment. At nightfall, venture into the desert to find tables set and lit by dancing candlelight. Heaters are pumped because desert nights can be cold, and dinner, prepared from local Australian ingredients, is served. 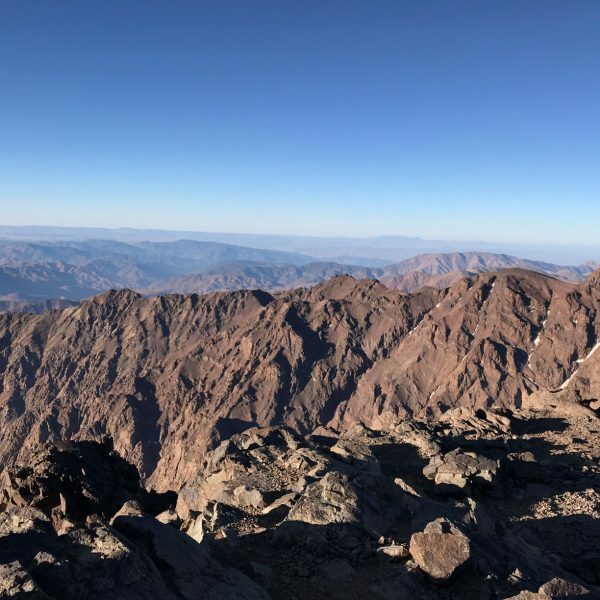 After dinner, a professional astronomer takes you on a journey through the night sky to admire the Milky Way, spot the Southern Cross and Alpha Centauri, or get closer look through the telescope. Sounds good, doesn’t it? 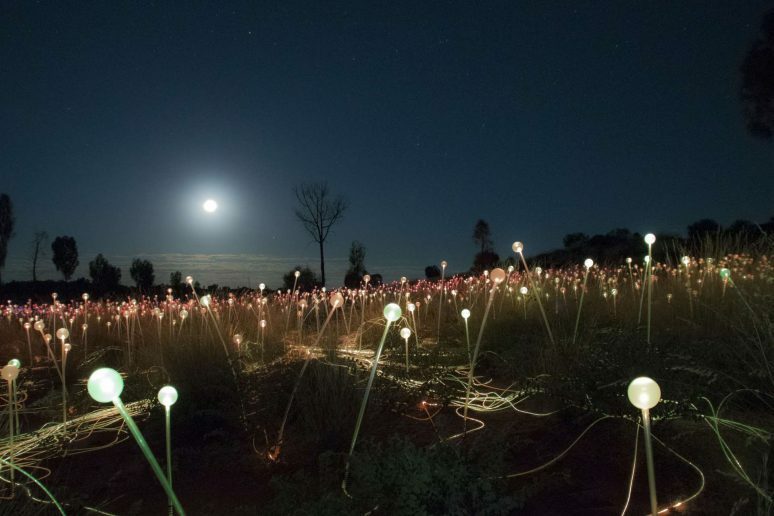 You can choose from two options for the dinner under the stars at Uluru depending on your budget: Sound of Silence and Tali Wiru. Ayers Rock isn’t the only impressive rock formation in the Red Centre. Kata Tjuta, also known as The Olgas, means “many heads” in aboriginal language. True to its name, Kata Tjuta consists of 36 large domes that you can explore from the two main hiking tracks: The Valley of the Winds and The Walpa Gorge. Just like Uluru, Kata Tjuta has great cultural significance for the Anangu Aborigines. The Aborigines believe that the great domes are home to the spirit energies and still use the site for religious ceremonies. We chose the Valley of the Winds walk that took us on a path around the red domes. The landscape appears so ancient that it felt like a dinosaur could pass by at any moment! 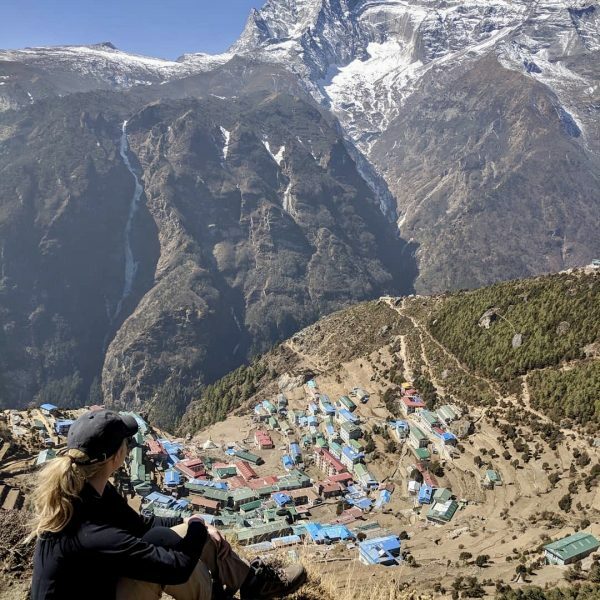 It was physically challenging at times involved a bit of climbing, but the views were worth every drop of sweat. The Anangu people group is one of the oldest cultures known to humans, dating back as far as 60,000 years. 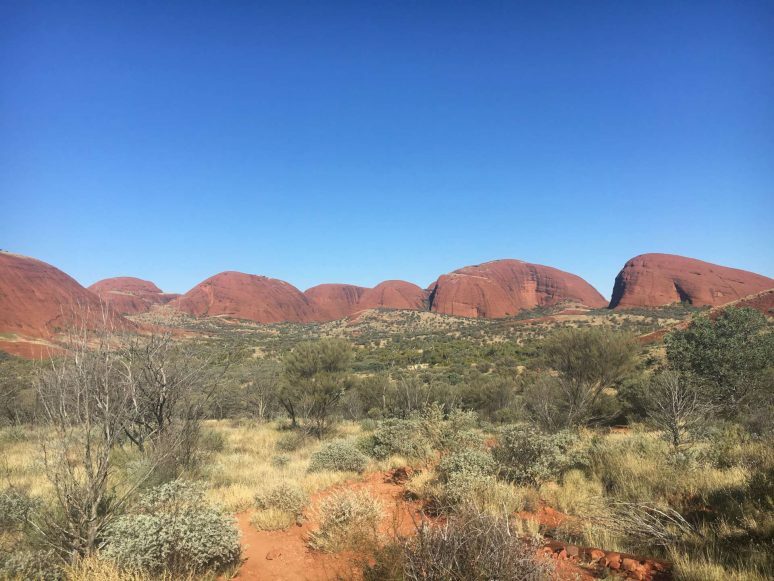 According to their traditional beliefs, our Earth used to be a featureless place and the landscape was created by the Anangu ancestors, who were raised “at the beginning of time.” They started their journey across the land, creating the rock formations of Uluru and Kata Tjuta. They have been the traditional owners of Uluru and its surroundings for over 30,000 years. For them, it’s a sacred place where they still come to its caves and rock outcroppings to perform rituals and make new paintings. If you are at all interested in the aboriginal culture, Uluru and Kata Tjuta are the best places to learn more about their traditions. Here you can admire the unique art, listen to incredible stories, and observe their cultural performances. Getting to Uluru is easy, as there are a couple of direct flights daily from every capital of Australia. 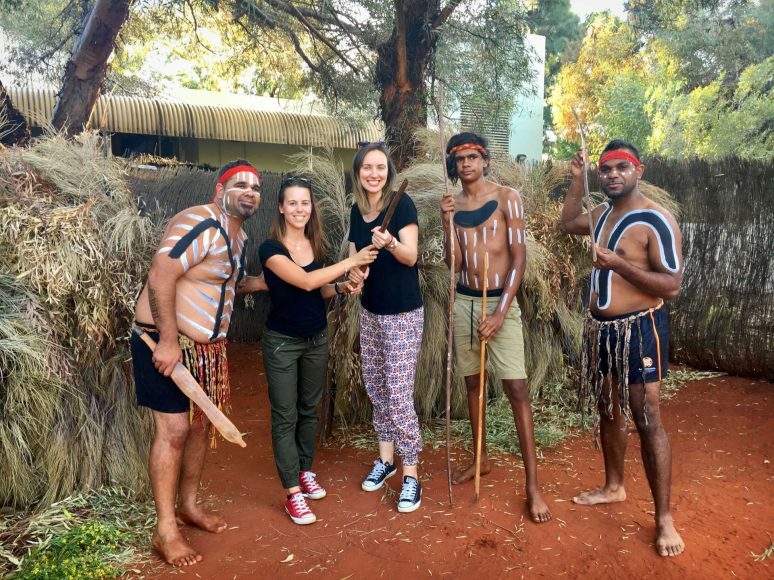 You have two options for booking flights: fly directly to Yullara, a small town right next to the Uluru and Kata Tjuta National Park, or fly to Alice Springs. In Yullara, there is really only one resort, called Ayers Rock Resort, offering accommodation for all budgets, from camping to luxury hotels. On their website, you will find the necessary information about tours, activities, history, itineraries, restaurants etc. Honestly, this was the only website I used when planning our trip. You can also opt to fly into Alice Springs, which is the biggest town in the Australian outback, located about 450 km north-west from Uluru. If you choose this route, you can stop at the Kings Canyon on your way to Uluru. 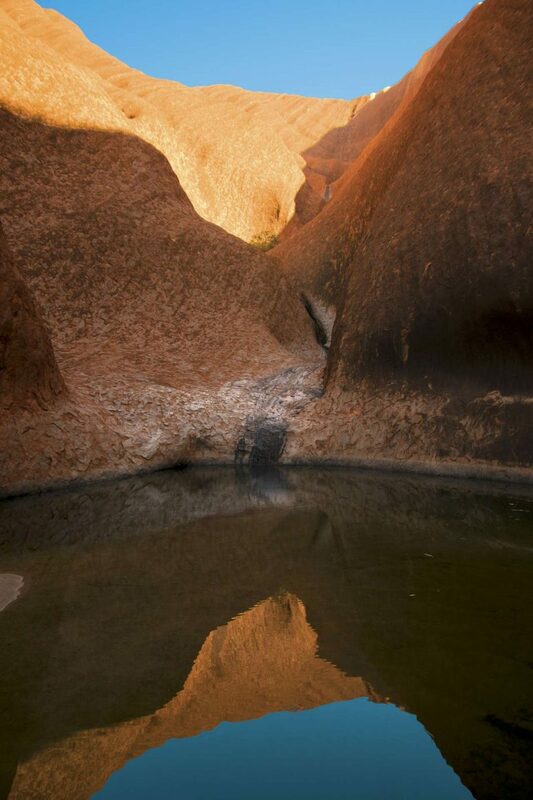 Kings Canyon is another sacred Aboriginal site located in the Watarrka National Park. Even though you’re legally allowed to climb Uluru, it doesn’t mean that you should. Be warned that this hike is extremely dangerous. The walls of Uluru are very steep, and there is no real path or shade from the heat. Many people have died attempting to hike here, as they’ve overestimated their own physical strength and endurance. Not only is it unsafe, but the Anangu Aboriginals consider it disrespectful to hike Uluru. 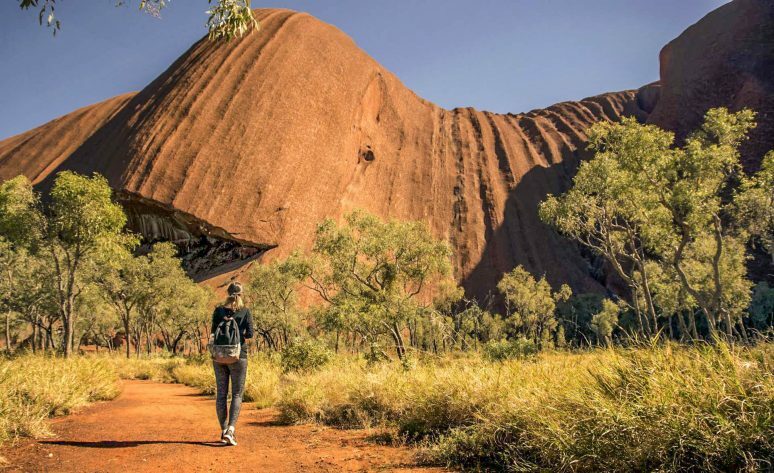 Interestingly, the Australian government promised the Anangu people that if less than 40% of visitors wanted to do the climb, they government would ban it altogether. Nowadays, less than 10% of visitors wish to go up, and yet the climb is still open. However, according to the recent news, it will be closed soon. If the danger doesn’t deter you, I hope your respect for the local culture will. Although beautiful, it is important to remember that the Australian outback has one of the harshest climates you can experience. First, be prepared for the heat, which is most intense during the summer months of December to February. Even during our visit in May, the temperatures got up to 28 degrees Celsius. Whenever you visit, bring lots of strong sunscreen and apply regularly. Second, the Australian outback is home to tons of flies and insects. Flies are hardly deterred by mosquito repellant, so one option is to buy a hat with a facial net once you arrive. It might not be stylish, but it’s effective! I hope after reading this article you are ready to start planning your visit the Heart of Australia. I promise it will not disappoint. 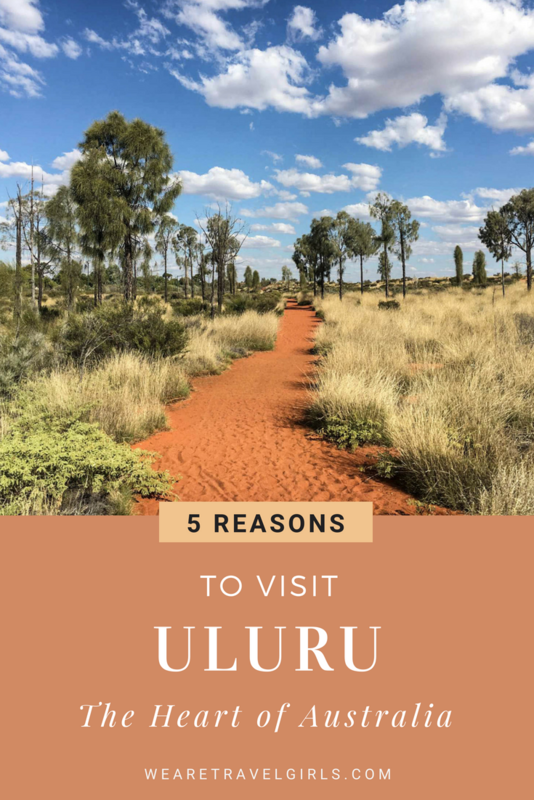 If you’ve already been to Uluru, please let us know about your experience in the comments below! We hope that this article has inspired you to visit Uluru. If you have any questions about the destination please leave these in the comments below. It is amazing article, very nice photos. The idea very inspirate. This article is very inspirate, with beautiful photos, I hope that I see this country in live, because this story me fascinate. I am looking forward on next story from Anna.